When heading to the bathroom to wash up, or perhaps read a magazine for 10 or 15 minutes, everyone prefers to be in a pleasant looking environment. Some people might assume that updating one of the most important rooms in the house has to be a huge drain on time and money, but this is not necessarily so. An ABC affiliate based in San Antonio, Texas, KSAT, recently reported on some specific aspects of bathroom decor that people might want to think about when refurbishing their bathrooms. In addition to putting some time into polishing the existing grout and bathtub, the news provider states that simply installing new bathroom faucets could make the rest of the room feel newer. 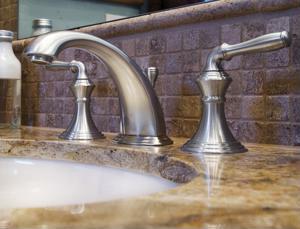 KSAT's recommended styles include brushed nickel, chrome, oil-rubbed bronze and steel. The station also explains why having a toilet with a modern design can impact the rest of the room for the better - especially if your toilet is so outdated that it's starting to leak or malfunction in some other way. Sometimes, getting a new toilet is less expensive than hiring a plumber to resolve an existing toilet problem, however KSAT encourages people to hire someone who knows what they're doing when it comes to the toilet installation process. If individuals feel they need more help or guidance redesigning their bathrooms, they should know, as Apple has famously stated, "There's an app for that." Business2Community compiled a review of its favorite mobile applications dedicated to home improvement. Home Design 3D helps users map out a room's dimensions and figure out how furniture can be rearranged in order to create a blueprint. "It's a great way for the indecisive bathroom renovators among us to try out different plumbing fixtures before they make a commitment," wrote blogger Lucy Clark on Business2Community. The news provider goes on to point to Bubble Level, which turns a smartphone into a bubble leveling device. There's also HandyMan DIY, an information resource for homeowners looking to embark on renovation projects on their own, and the ID Wood app. The latter is said to feature an extensive amount of information of different styles of wood, so homeowners can decide which they prefer for a new cabinet or other type of wooden furniture.